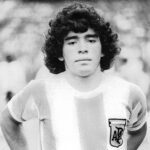 On 27 February 1977, Argentina beat Hungary 5–1 in a friendly that marked the international debut of 16-year-old Diego Maradona. For the friendly, they met at the Bombonera in Buenos Aires, where approximately 60,000 people turned out to watch. By half time, the hosts were up 4–0 with a hat-trick from Daniel Bertoni (11', 18') and a goal from Leopoldo Luque (37'). Luque added another just after the break (47') to extend the lead to 5–0 before Hungary substitute Zombori Sándor pulled one back in the 61st minute.